Emily Parker is the Campaign Communications Manager for Meredith College. She creates and implements communication programs that increase awareness and participation in the College’s Beyond Strong fundraising campaign. She brings 17 years of public relations and marketing experience in industry and academia. 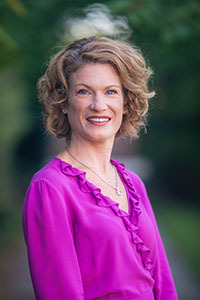 Prior to joining Meredith, Parker worked at NC State University for over 13 years as the director of communications and marketing at the College of Textiles. She has also held positions as an account executive at a Winston-Salem based advertising agency, a sales promotions manager at Burlington Industries, and began her career at Hanes. Parker holds a Bachelor of Science in Textile and Apparel Management from NC State University with a concentration in marketing as well as a minor in Interior Design at Meredith College.